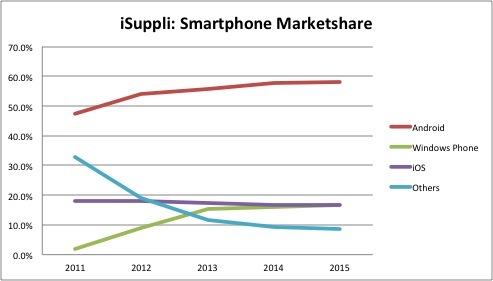 As we can see, the smartphone penetration is still relatively low but growing very quickly. 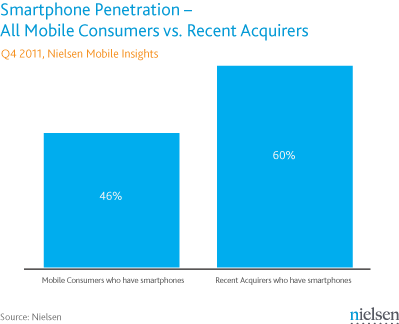 The overall market growth for mobile devices is at 10.8% according to iSuppli and both Nielsen and iSuppli expect that 60% of devices sold in 2015 will be smartphones. That means that there is plenty of marketshare to grab amid the double digit device growth, the rapid growth of smartphone penetration and the decline of other vendors. Google has grabbed a ton of market share thanks to all the Asian manufacturers such as Samsung, LG, HTC, Sony, etc. They all needed an operating system and since Google Android is free, the choice was easy. So far so good except that there are three big problems looming ahead. First, as a result of the open source model, the Google market has become massively fragmented and application developers struggle to support all the device types. Second, Google acquired Motorola which will make it difficult to keep the competition honest between its own devices and the other vendors. Third, Google is hardly making any money on Android - in fact they are paying hefty patent fees to Microsoft for each device - which makes it a hard business to sustain for a publicly traded company. Apple may have lost the top market share spot to Google but honestly, Apple is running circles around everybody. Leveraging their unique value proposition of a tightly integrated system consisting of hardware, software and content, Apple is just piling up profits and making everyone else look bad. Make no mistake, the market share loss in units has nothing to do with market share in revenue and profits where Apple is standing head and shoulders above the rest of the industry combined. The decline in units market share is not a result of an inferior product or any systemic problem. It is more the result of the fact that many users are upgrading their feature phones and opting for the cheapest smartphone available without caring much about the operating system. Those users are clearly not Apple’s target customers. Apple is after the more affluent user who will not only shell out a premium price for a premium brand but who will also keep contributing to Apple’s profits through ongoing purchases on iTunes. Unlike Google who’s Android is basically a less polished version of Apple’s iOS, Microsoft has built a very distinct and compelling mobile operating system. But adoption is so far eluding Microsoft for several reasons. The vendors selling Microsoft Phone devices are the same lot as those who sell Android. Android is free and Windows Phone is not and so guess who they push more? The second issue is that Microsoft has bet the farm on their Nokia partnership which was a smart move except that Nokia didn’t ship any Windows phones until the end of last year. The third and by far most important issue is the lack of developer support. Apple and Google have attracted many developers quickly leveraging superior tools, compelling business models and - in the case of Google - the open source effect. Microsoft has shown little love to developers so far. Unless Microsoft addresses these issues, they will always continue battling at best for the third place. Well, it has been widely reported that RIM is in trouble and just replacing the CEOs is not going to fix that. RIM’s greatest problem is the lack of innovation. The good old BlackBerry may work fine and be more secure than iPhone but it is no longer hip enough even for the executives at stodgy brick-and-mortar companies. Today, RIM needs a purpose, a focus, and a compelling way to differentiate. Leaking pictures of phones that could ship in two years and be almost as cool as the iPhone is today is not going to do it. Even if those new RIM phones were available today, it would hardly make much difference. 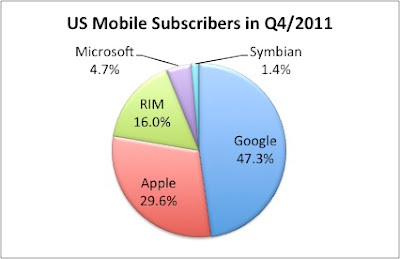 Besides needing some innovative and competitive products, RIM also has to address the developer support just like Microsoft. To be complete, I should also mention HP as the only other remaining MOS vendor. Or did they announced that they have killed webOS? Yeah, whatever. I will write another post when I meet a user with a webOS based smartphone.